We've collaborated with Support Dogs to bring you a wonderful bouquet from which we will donate 10% of the sale price to the charity. Packed full of white gerbera, blue iris and white freesia, this flawless floral arrangement is handmade to order by one of our enthusiastic team of skilled florists. Since 1992, Support Dogs have devoted themselves to helping children and adults affected by the most challenging of conditions through specialist assistance dog partnerships. These life-changing partnerships provide help with everyday tasks for people with physical disabilities, give advance warning of seizures for people with epilepsy and provide safety and support for children with autism and their families. The charity relies on donations and fundraising to continue this important work - learn more about how you can help Support Dogs today. 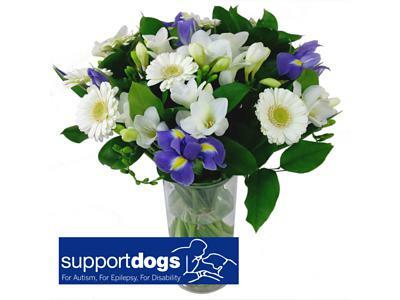 The Support Dogs Charity Bouquet forms part of our exclusive Charity Bouquets Collection, a wonderful range of beautiful bouquets designed specifically to help charitable causes. Want to add a little bit more to your order? Check out our range of optional extras including a stylish glass vase, cute and cuddly teddy, yummy chocolates and lovely handwritten card.